Our 5 Star Maintenance Plan is the most comprehensive Boiler and Central Heating cover available at this affordable price - which means you don't have to worry about breakdowns or big bills. What's more if you don't need to call us out we'll give you £50 cashback each year you don't make a claim. Control systems including timers and thermostats. £50 cashback every year that you remain claim free. The Nationwide Gas Care 5 Star Plan is only available to new boiler owners who apply within 7 years of the installation of a new high efficiency boiler from a reputable manufacturer. This enables us to keep our costs permanently low. Pre-existing faults at the time of taking out the policy including system design faults or inaccessible components. Faults caused by the failure of gas, water or electrical supply services or consumer negligence. 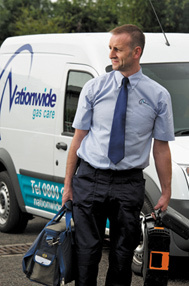 Any faults caused by sludge or blockages. The cost of decorating parts, casings, paint work, batteries, bulbs, enamel, wood and any damage which does not prevent the functioning of the appliance. Damage caused by; freezing weather conditions, lightning, fire, explosion, storm, flood, changes to or failure of electricity, gas and water supplies. Whats included in your Annual System & Safety Check? The engineer will leave your premises in a clean and tidy condition and request your signature on the completed job sheet. Any remedial work required, would have to be carried out at your own cost (first service visit only).